Progress has been pretty decent with the hatch over the past few days. 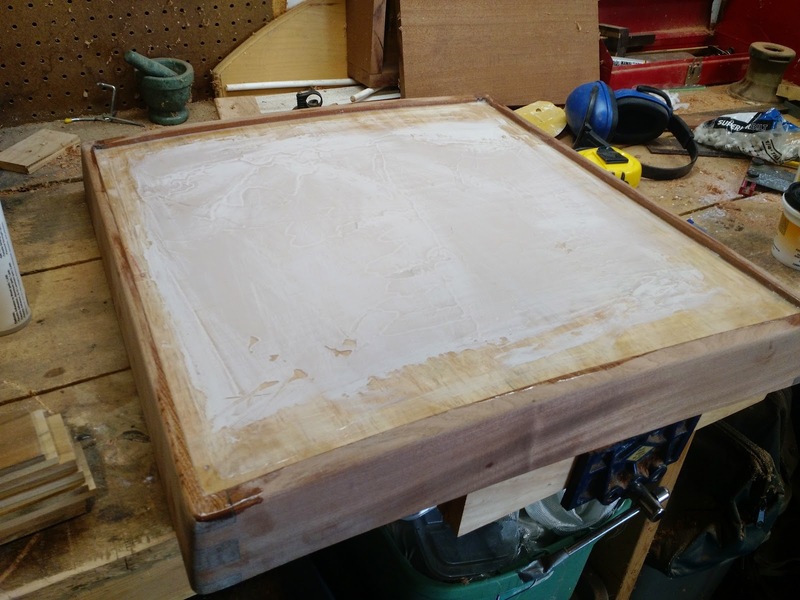 I epoxied in the 1/4" plywood subdeck to the rabbets running the perimeter of the hatch and then coated it with a layer of un-thickened epoxy. 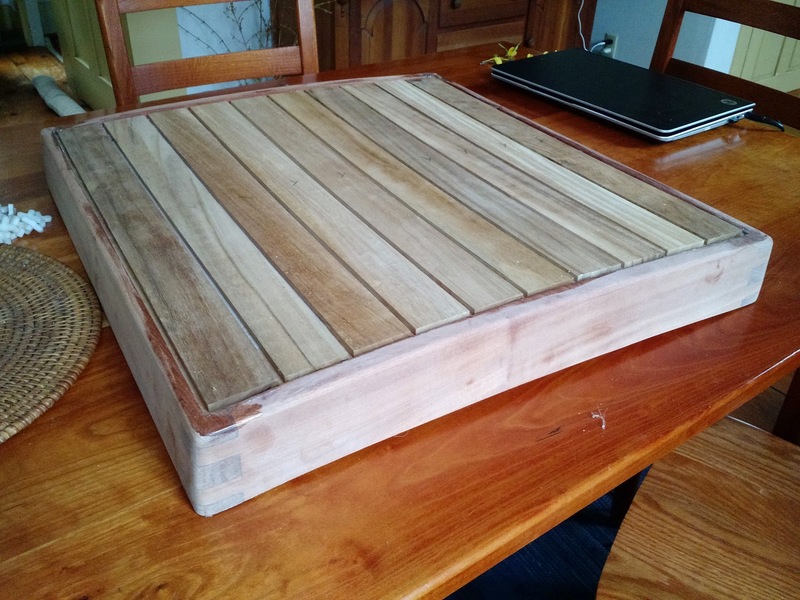 Originally, I was planning on laminating in a layer of 6oz cloth, but I was a little worried that the additional thickness would cause the teak planks to sit proud of the perimeter of the hatch. 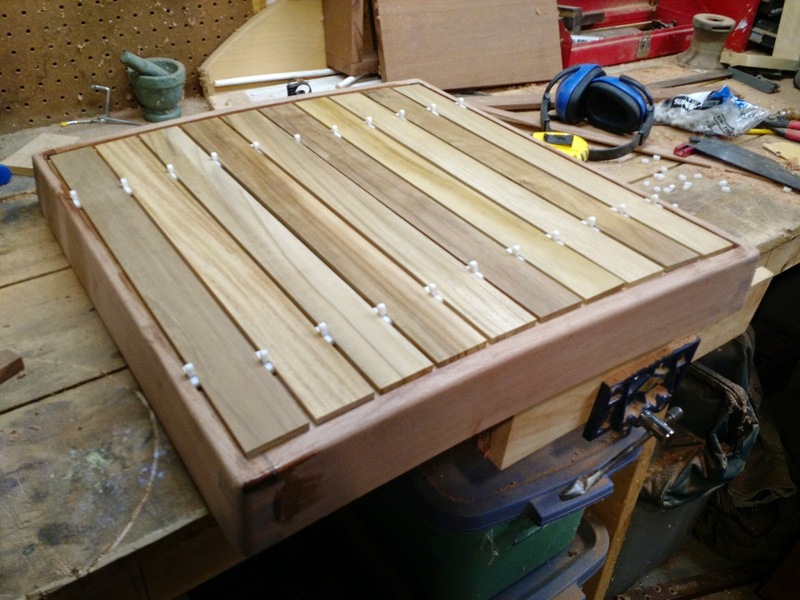 Basically, the rabbet I cut was 1/2" deep and the 1/4" plywood plus 1/4" teak decking fills that rabbet up with no room for anything else. It probably would have been fine, but I decided that instead I would laminate a piece of 1706 biaxial fabric to the underside of the hatch before putting on a wood facia. 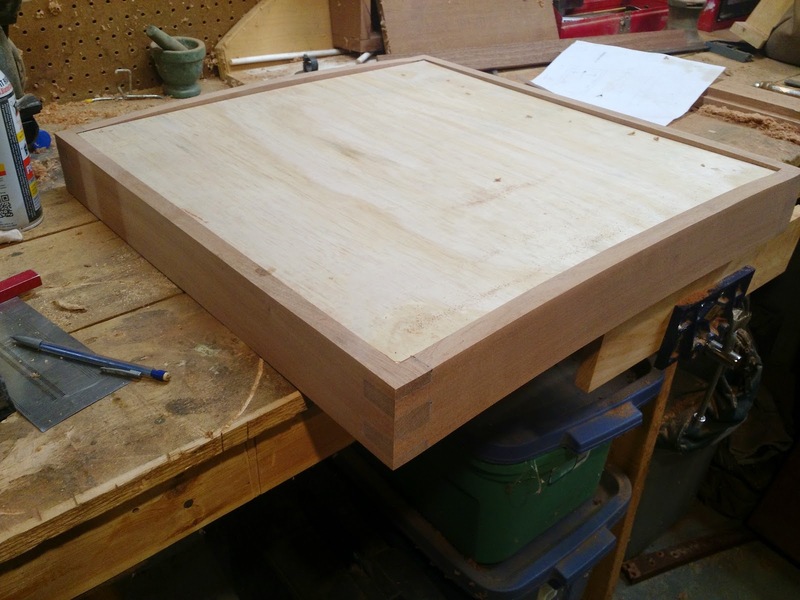 That would probably be overkill so I may end up just doing a 6oz layer, but I want to get a feel for how stiff the center of the hatch is with both teak and plywood laminated. 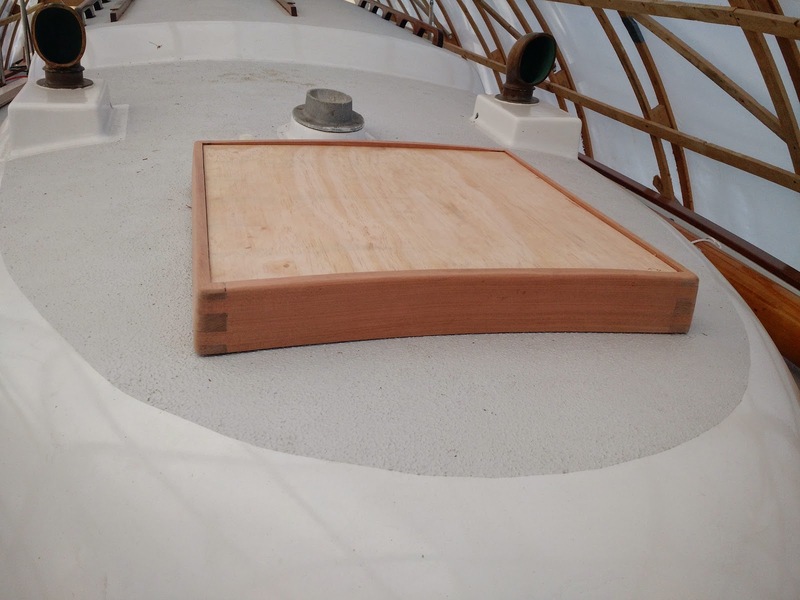 Anyway, after I epoxied over the plywood deck, I noticed that the center of the hatch had a slight depression in it. A straight edge revealed that I had an 1/8" depression. I want the teak to sit as flat as possible so I mixed up a batch of Quick Fair and troweled it over the depressed section. I didn't totally eliminate it, but took care of most of it. Next, I did some shaping at the corners and cut a 6 degree sloping angle from the bottom up on the sides to give it a 'sporty' look. Not really, but one of the things I didn't like about my last hatch was that even though it was curved to fit the camber of the deck it looked a bit boxy. I think this should help. You have 10 pieces of wood, each 3 inches wide and they need to be evenly spaced over 21.125 inches. 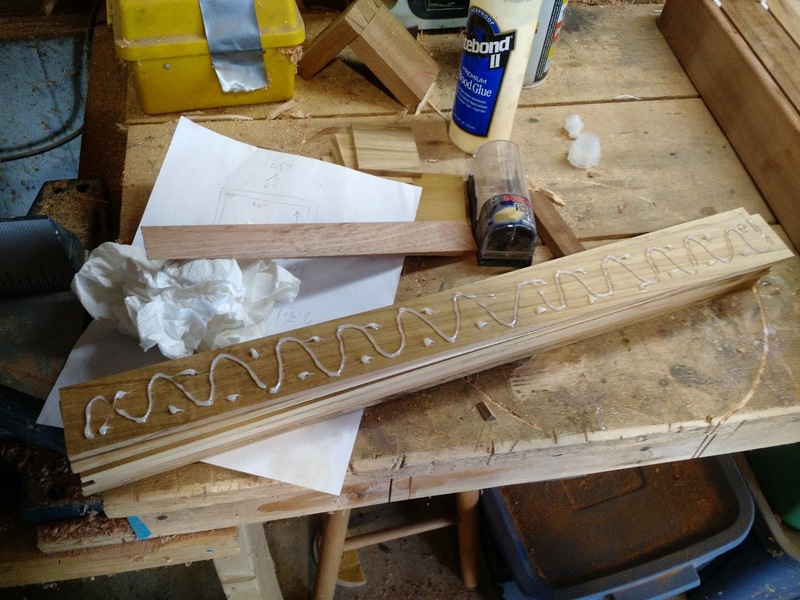 Each piece needs to have a .25 inch gap between the next board. How wide does each board need to be? Once I had checked and rechecked my calculations, I went ahead and ripped them on the table saw. Fortunately, I was correct, and they all fit nicely. At that point it was time to glue them in, so using a tube of Jamestown Distributors Total Boat Thixo (the epoxy that is in a caulking tube and mixes when squeezed through a nozzle), I globbed on a bunch on the back of each strip and squished it in place. Once I had them all on the hatch, I used rubber tile spacers to keep 1/4 inch between each board. I stacked a bunch of weight on top and let it cure up overnight. I'm really pleased with how it turned out; I had never worked with teak decking to any degree before, hopefully the black caulking that comes next will work out too.